Analytics: When to use displacement, velocity or acceleration amplitude units in vibration analysis? A novice vibration analyst always has a question whether to use displacement, velocity or acceleration amplitude unit? Here is a rule of thumb based on the frequency. Displacement is a good measure at lower frequencies especially less than 5 Hz. The failure mode is generally the “stress” causing due to the displacement. Velocity measures how often the displacement is being applied in a given time period. It is related to the fatigue mode of failure. Velocity amplitude unit is a good measure in the range of 5-2000 Hz frequency. Even at small displacement amplitude the repeated motion can cause fatigue failure. Above the 2000 Hz the failure is normally force related. Acceleration is measure of the likelihood of force being the mode of failure. There are areas on chart where stress, fatigue and force related failures overlap. The proper selection of amplitude unit will depend upon the application under study. 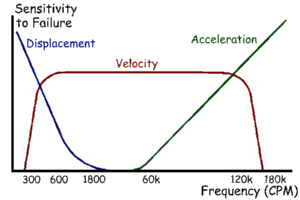 Note that frequency, displacement, velocity and acceleration are related. Knowing any 2 quantities, other variables can be easily calculated. Thanks a lot for this ionformation. Any frequency above 2kHz can be called as high frequency.Can you please clearly specify which frequencies should fall under Low frequency band and medium frequency band? Why use displacement, velocity or acceleration in vibration analysis? Where can I buy good quality vibration measuring equipments? Please tell me how to convert Acceleration Enveloping, gE (ENV3) to – Acceleration, g? Actually I'm very confuse about gE and don't know what it means? Never heard of 2000Hz machines! Automotive turbochargers can run in excess of 200,000rpm.